Remember that profile-specific social network search tool Mark Zukerberg announced back in January? It’s finally ready for the general public. 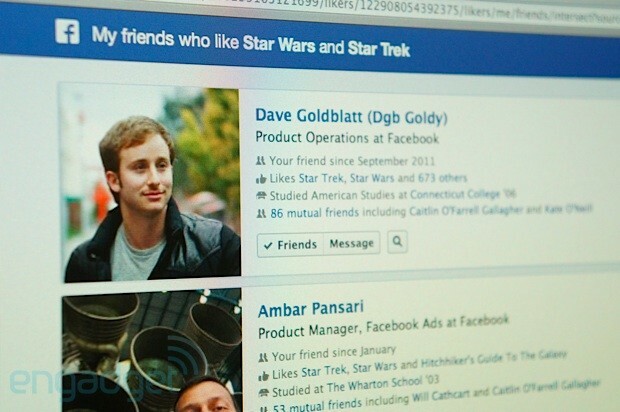 According to the New York Times and ABC News, Facebook Graph Search will start rolling out to US users this Monday. The update is more than a simple search bar revamp, however — it allows users to mine their social circle for very specific information, asking questions like “Who are my friends in San Francisco,” or searching for “people who went to Stanford who like the 49ers.” The tool is designed to harken back to the company’s original goal of connecting people, and aims to help users draw lines between their friends and interests. Graph Search will also pull select data from Bing, allowing users to peek at the weather from the comfort of their timeline. Despite launching on a wider scale, the service isn’t perfect — the New York Times reports that it still has trouble juggling synonymous phrases (something we experienced in our own hands-on), returning discrepant results for searches like “people who like to surf” and “people who like surfing.” The tool also works within the confines of a user’s privacy settings and public activity, meaning that you won’t accidentally uncover your cousin’s secret My Little Pony fan-group if its privacy settings are locked down. The feature is set to debut for a few hundred million users this week, and will continue to become available to the all US users in the coming weeks. It would appear that Facebook Home has just surpassed 500k downloads on Google Play since launching on the platform five days ago on April 16. The app’s Google Play listing notes the milestone, and Ben Evans confirmed on Twitter. Facebook Home isn’t so much of an app as a user interface for the phone, putting Facebook smack dab in the center of Android users’ smartphone experience. Users with Facebook Home can post status updates and view the newsfeed straight from the lock screen, and conduct messaging without ever being interrupted, thanks to Chat Heads. In essence, it’s Facebook’s push past being an app like every other app and being a central force of the smartphone, a launch pad. Hopes are seriously high, as foreshadowed by Zuckerberg’s sweaty brow at the announcement, but word had originally circulated that users weren’t all that into Facebook Home around launch day. Clearly, that’s not true as the app has garnered over 100,000 downloads a day since launch. Still, these aren’t blow-out numbers. Remember when Instagram launched on Android and hit over 1 million downloads in a day? And then hit over 5 million downloads in six days? Yeah. Those were blow-out numbers. You also have to consider that Facebook has over a billion users, so 500K doesn’t really move the needle. But in Facebook’s defense, the Home application is only available on select devices, including the Samsung Galaxy S III, Galaxy Note II, HTC One X, and the HTC One X+, along with the Facebook Phone, the HTC First. Oh, and Facebook is now quite happy for Instagram’s success on Android after that slight $1 billion acquisition. Facebook will soon be rolling out a new site design that, among other things, will change the way your profile looks. But you can check it out today by logging into your account and then visiting www.new.facebook.com. One of the most prominent new features will be an emphasis on the mini-feed. In fact, it might be safer to start calling it a news feed, since it’s not so mini-anymore. When you first view a profile, what you’ll see is a list of recent activity on that account. You can also click on tabs for Info, Photos, or Boxes. Info brings up your contact information, group membership, and other info. Boxes shows all the Facebook apps that are currently littering your main profile page. And we’re going to let you figure out for yourself what shows up in the Photos tab. Update: Facebook seems to have disabled the http://www.new.facebook.com page sometime in the last few hours. But trust us, it looks something like the image above! BetaNews has learned that amidst MySpace’s move to join Google’s OpenSocial community, Microsoft is now in talks with Facebook to integrate Windows Live ID into the quickly growing social network. Reliable sources tell BetaNews that the two companies have begun talks on integrating login systems following an advertising agreement that gives Microsoft a 1.6 percent stake in Facebook in exchange for $240 million. Microsoft previously pushed its Passport authentication system — now renamed to Windows Live ID — on third-party sites such as eBay. But that effort was eventually abandoned and Microsoft has focused on making Live ID work across the Redmond company’s own services, including its Xbox Live gaming platform. With Google’s move to become the primary platform for social networking-based applications, however, Microsoft appears to have changed course. Late Thursday came news that MySpace would join Google’s newly announced OpenSocial API platform, handing a huge win to the search giant. Bebo and others like Friendster are also joining Google. Facebook was the first site to truly open up for third party developers to create mini-applications that can run on users’ profiles. Companies are eager to tap into the massive visitor bases on social networking sites, which gives them instant exposure and an audience that could potentially bring in revenues. The largest Facebook applications count millions of users, which would not have been possible without the viral nature of the site. While many of Facebook’s rivals announced plans to develop their own open platforms, almost everyone has now opted to join Google on OpenSocial. Google said it has been working with MySpace for a year on building the platform, which began shortly after the two companies inked a $900 million advertising agreement. With the addition of MySpace and Bebo, Google now counts far more users than Facebook, so developers may opt to create applications for OpenSocial rather than the individual site. Facebook was apparently not told of Google’s plans, but the site could still add compatibility for OpenSocial’s APIs. However, that would mean Facebook loses control of the platform to Google, which may be difficult for the company to accept. At the end of the day, however, it’s still not clear how big of a market there is for applications running on social networking sites. While a handful such as Slide and iLike have garnered millions of users, most developers count mere thousands. In addition, no application developer has found a good way to monetize those users – something that Google will surely be focused on through OpenSocial. Industry pundit Michael Arrington expects Facebook to join Google, because if it doesn’t the site will look like the closed outsider. But Microsoft, with its newfound ties to Facebook, may not want to give in so easily – especially if it is successful in adding Windows Live ID to the site. The two companies could attempt to leverage Microsoft’s huge developer community and create their own standard that also spans Windows Live Spaces, setting up a showdown with Google and MySpace.